On Tuesday, after months of hinting that a new climate change policy was in the works, Gov. Bill Walker signed an administrative order setting out a new state climate strategy and creating a task force to recommend specific actions. 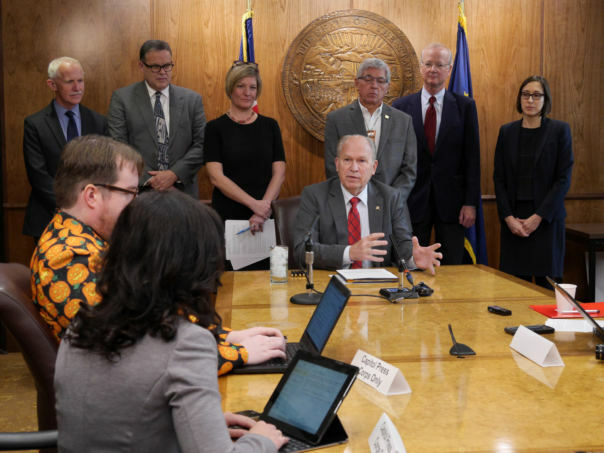 The 15-person “Climate Action for Alaska Leadership Team” will be chaired by Lt. Gov. Byron Mallott and will propose a climate change action plan. Those recommendations are due by September 2018. But whatever the team ultimately proposes, Walker made clear one thing is not in the cards: cutting back on oil exploration. As a state “on the front lines of climate change” that’s also dependent on oil development, Walker said Alaska has to strike a balance. Mallott went further in his remarks, suggesting it’s time for the state to start looking beyond oil. The “Leadership Team” will be made up of 15 members of the public, representing a cross-section of Alaskan interests. They will be tasked with making recommendations in four main areas: reducing greenhouse gas emissions, adapting to climate impacts, research and education and responding to near-term threats. Their final recommendations could include regulatory changes or legislation. The order also directs state agencies to identify actions they can take more immediately. Polly Carr heads up the Alaska Center in Anchorage. She said she’s pleased the Walker administration is acknowledging the need to respond to climate change. Carr pointed out that Alaska has done this before. Almost exactly ten years ago, former Gov. Sarah Palin issued her own administrative order, establishing climate strategy and creating a task force: the climate change sub-cabinet. That group worked for more than two years and came up with a slew of recommendations, many of which have yet to be adopted. Carr said it’s important that this time around, recommendations are followed by action. “The more quickly that this announcement can move to action and policy, the better off all of us are going to be,” Carr said. Moriarty said her members are ready to work with the administration on climate issues. But, she said when Alaska represents just a fraction of global carbon emissions, it’s important to weigh emissions cuts against the impact to the economy. “You could turn off every oil spigot, every natural gas pump, turn off every light, shut down every car and I’m not sure it’s going to even make a dent in the overall global emissions picture,” Moriarty said. While her members would oppose any efforts to discourage oil development, Moriarty said when it comes to adaptation or research, industry believes it has a role to play.